The following article and pictures were contributed by Kwazulu Natal genealogy expert Rosemary Dixon-Smith. Information on genealogy is available here. When I was a child growing up in Durban in the 1950s and 60s, one of the highlights was the annual visit to the circus, accompanied by my Grandmother (Maud Alice GADSDEN, nee SWIRES). Looking back, though she pretended this treat was for my benefit, I think she enjoyed it even more than I did and suspect that my Gran was addicted to circuses. She had stories galore of circus events and personalities, and especially about PAGEL'S Circus, which I was too young to remember. With the bloodthirsty tendencies typical of children, I particularly liked her tale of Mr Pagel whose lion-training act included putting his head in the lion's mouth. According to my Grandmother, on the last occasion he performed this dangerous trick, things didn't go too well, resulting in the gruesome public death of Mr Pagel. She also told me that Madam Pagel, a volatile lady, had been considered far more unpredictable than any of her husband's wild animals. But family anecdote, as we all know, is often unreliable, presenting a partial rather than the whole truth. It came as no surprise to me when I later discovered that Mr Pagel, though badly mauled on several occasions during his long career and bearing numerous scars, actually died peacefully in his sleep at the age of 70. I must say I prefer my grandmother's version. She was right about Mrs Pagel, though, and more of this legendary character anon. For most Natalians born and bred, the circus brings two famous names to mind: BOSWELL and WILKIE. * However, numerous other circuses have paid visits to Natal and this form of entertainment goes a long way back in the history of the province. In the days when Natal was still a British Colony, Durban and Pietermaritzburg, as well as other smaller centres, were regularly invaded by circus folk, bringing fun and excitement and the lingering smell of sawdust to inhabitants who knew nothing of the canned delights of radio and television. It also seems that the "Ladies' Night" concept was not unknown in 1880: at Bell's "Grand Society Soiree" on Thursday, April 22, "Every lady accompanied by a gentleman will be admitted free to first and second class seats." On the Tuesday evening, a "Grand Fashionable Night" was to be held under the distinguished patronage of no less than His Excellency Sir Garnet WOLSELEY, G.C.M.G., K.C.B., and Staff. It seems remarkable that, in the aftermath of the Anglo-Zulu War of 1879 when mopping-up operations were continuing in Zululand, anyone was thinking about circuses, let alone the Irish Poor. Perhaps Mr Bell himself was Irish. We shall hope he wasn't planning to be the recipient of the proceeds. It's not certain what act "the Popular Artiste MONS. Edouard " performed at his own benefit on Friday, April 23, but at the Saturday matinee and evening show, audiences were promised an "Oriental Fairy Spectacle" entitled "Cinderella Or the Little Glass Slipper." Below the list of enticing events offered in the daily paper, a more practical note is struck by: "Wanted: Transport (Mule or Oxen) on or about May 10, to convey Bell's Circus Company from Maritzburg to the Point, Durban, about 20 tons. Apply stating lowest price." One wonders which contractor took on this mammoth task. Transport was only one of the headaches for circus proprietors. Because of the number and variety of animals - dogs and horses as well as wilder beasts - travelling from one part of the country to another involved licence regulations and many restrictions, as well as checks by government veterinarians to prevent possible spread of disease. Horse-sickness, for example, was rife, and in 1911 Madame FILLIS's Circus experienced some difficulty with the authorities when wanting to bring seven horses from the Transvaal into Natal. In circuses of the 19th and early 20th centuries, the horse dominated the scene. Frank Fillis was the founder of a British circus which toured throughout the western world, and presented sophisticated horse routines. WIRTH's Circus went one better than run-of-the-mill performing dogs, bringing a couple of wild Australian dingos to delight the crowds in 1894. They travelled on the SS Methven Castle, and a licence was granted on the condition that the animals were kept chained up while in Natal. Not ideal circumstances for the dingos, but they were a draw-card for Wirth's. In 1902 BONAMICI's Imperial Circus toured Natal by rail, with 1109 tons of baggage including animals. Since this was the period immediately following the Anglo-Boer War, there were complaints that the transport of the circus interfered with the normal workings of the railway, especially considering "the large quantity of Military and Repatriation traffic". The General Manager of the Natal Government Railways wrote to the Acting Prime Minister to say that the circus had been conveyed from Ladysmith without any disruption to that station. Starting out in Durban, Bonamici's had travelled to Pietermaritzburg, then to Ladysmith, and on to half a dozen large towns. Living up to the origins of their owner's name (Good Friends) Bonamici's Circus didn't forget the less fortunate members of the populace during their triumphal progress through Natal. Fifty patients from the Natal Government Asylum were admitted free of charge to one of the matinee performances.
." A bit of name-dropping never did a circus any harm. The lure of circus life led one young African, Mhlatikazi, to join Wirth's company while it was in Natal in 1895. His father, of the Mapumulo Magistracy, complained, via his chief, to the Secretary of Native Affairs that his son, then 17 years old, was about to be spirited out of the Colony by the circus and requesting that the authorities take steps to prevent this. In the Times of Natal, May 20 1895, there was a report that Wirth's had left for "up-country" but would be returning to Durban in due course. The boy's father was advised to try and see his son on the circus's return, and to persuade him to come home, but the anxious parent had no means of travelling to Durban. Unfortunately, the official records don't reveal what happened, but it seems likely that Mhlatikazi took his opportunity to see the world. Other such stories ended unhappily. Pagel's Circus in July 1913 left behind at Richmond, presumably by mistake, one Harry ZWAARTBOY, a native of East London. With his employers gone and being far from home, the boy was destitute, resorted to house-breaking and theft and was finally jailed, though the authorities did make some attempt to restore him to his family. This gives us a rather different view of the glamour and excitement surrounding circuses in Natal, and it is certainly true that not everyone welcomed their arrival. Any circus was a small travelling town in itself, and presented many practical problems, not the least of which was sanitation. Whatever site was allocated for pitching the tents was bound to cause objections from people living or conducting business in the vicinity. The Norfolk Hotel took exception to Pagel's camping on the vacant lot directly opposite their establishment in Upper Church Street, Pietermaritzburg in August 1928, saying that the site was "within 75 yards of the Hotel and in our opinion will be very harmful to our business, owing to the noise and probably smell of the animals", not to mention the crowds who would doubtless congregate around the tents at all hours of the day and night. Usually, the spot chosen for the circus to camp in Pietermaritzburg was the Market Square, but this site, too, gave rise to petitions from the local inhabitants who felt that the circus "constituted a nuisance." a response to the Norfolk Hotel's unreasonable complaints! Undeterred, Pagel's Circus and Menagerie continued to advertise their regular appearances in Natal, promising "All Star Performers from the Principal Circuses of Europe and America," and Natalians of every race, colour and creed flocked to pay their admittance of 2, 3 or 4 shillings (children to matinees at one and twopence). Herr William Pagel was one of the greatest showmen of his day, and knew what the public wanted. He was German by birth (born in 1878) and after an early career at sea settled in Australia where he worked in a restaurant as dishwasher and bouncer. Extremely well-built (about 6 foot tall and between 280-300 lbs, with enormous forearms), he soon joined a circus as strongman and eventually made enough capital to buy his own tent, holding 200 people. In February 1905 he sailed for Natal, and began touring South African centres. He developed his own animal training capabilities, particularly with lions, and carried the scars to prove it. Pagel was also famous for his tug o' war acts with four horses or alternatively with two elephants. He was renowned for carrying no stick or whip when in the ring, relying, as he himself said, on "no more formidable instruments than patience, kindness and love, to gain a high degree of ascendancy over the minds of the most savage of the beasts of prey. Many people imagine that when an animal is taught to perform a feat, it is coerced into doing something foreign to its instincts and nature. This is not so. Animals possess aptitudes just as human beings, and they vary almost as greatly. The trainer observes some peculiar aptitude in an animal and guides and develops it carefully, encouraging him by every imaginable means until he is able to perform what is for that species of animal an unusual feat." There was scarcely a type of circus animal which Herr Pagel didn't train. In 1910, a list of animals he brought into Natal from Transvaal included 5 horses, 9 ponies, 2 zebras, 1 camel, 4 elephants, 6 tigers, 3 lions, 5 leopards, 3 polar bears and a kangaroo. Pagel married Mary DINGDALE, a Yorkshirewoman some years older than himself, who kept her eye on the box-office and vied with her husband for colourful and courageous personality. 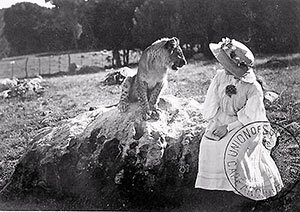 She had a pet black-maned lion which travelled with her wherever she went, ensuring good publicity for the show. Madam Pagel died aged 74 in 1939. William Pagel had retired in 1933 after wounds sustained during his animal act had become infected, and when he died in 1948 at the age of 70, his name had been synonymous with circus in South Africa for decades. <= Click picture to view enlargement. *Boswell Brothers' Circus, run by Stanley Boswell, was famous in South Africa during the 1950s. When the Boswells sold out to African Consolidated Theatres, the new owners merged it with Wilkie's in the early 1960s to form the Boswell-Wilkie Circus, managed by W H Wilkie. The Boswell family were not connected with this merged operation. Stanley Boswell's son Brian started his own circus, Brian's Circus, in South Africa in 1982.